Curtains and Roman Blinds and other soft furnishing custom made for you. I'm specialised in making Curtains,Roman Blinds,alterations and Lining changes etc.Also provide Curtains Fabric,blackout linning & Tracks. I make beautiful roman blinds and Drapes with a very high standard of workmanship. I would like to offer you my services on roman blinds and Drapes making. You can provide me with the fabric of your own choice and I will make beautiful roman blinds and Drapes your home or office at an affordable price. 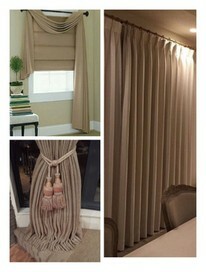 Please Feel free to email anytime,if you have any qeustions or query about having your roman blinds,Drapes custom made. You supply the fabric and I will provide a quality service and satisfying your requirements . There is 1 to 2 weeks turn around at the moment. Recently had some roman blinds made by this amazing woman. Beautifully made, perfect fit, excellent service and delivered in under a week. Thank you so much'!!! Thank you again for the awesome blind. It is perfect and looks amazing. Very happy customer. Made did a fantastic job of making my roman blind and with an amazingly quick turnaround too. Highly recommend! I have just had some drapes and blinds made by Madu,she is a pleasure to deal with and her quality of work is very professional and beautiful finished. With prompt communication and fast turnaround from start to finish , I am really impressed with Madu and her skill . Drapes and blinds lovely . Nothing but praise for Madu. Have now used her services twice to shorten sheer voile curtains and she has done a perfect job. With 2 X 4 meter wide drops at length of 205cms there is a lot of curtain to work with. Not a job I would want to tackle. Very prompt and efficient service. I'm really happy with the roman blinds and cushions made by Madu. She has also done a few excellent repairs for me as well. She'really efficient, reasonably priced and lovely to deal with. Madu did such a good job repairing our curtains that I contacted her again when we needed new curtains made. We provided measurements and selected the fabrics. She ordered the materials, collected them, and then made our curtains. And she made the perfectly :) Madu takes great pride in her craft, she is a perfectionist. I highly recommend her if you need curtains made, or repaired. Madu is the ultimate in customer service. Prompt, professional and excellent quality of work! My blinds were repaired within a couple of days and they look fantastic. Madu is the best. Madu is a pleasure to deal with. Prompt replies, fast service, and excellent work. I highly recommend her. Thank you again for the awesome blind. It is perfect and looks amazing. I can't believe how fast you got back to me and also how fast you made it! Very professional and efficient. Very happy customer. A fast and efficient service; Madu had my roman blinds made within 5 days.They were just as I hoped and look great in my revamped bedroom. Thank you. Madu has done an awesome job recently on my curtains and roman blind. The service in which she provided was both friendly and professional and I will certainly be using her in the future. My curtains are made to a very high standard and add that luxurious feel to my beautiful new room. Thankyou Madu.